There was this man who had a very small hut and a very large family, so he went to a wise man and told him about his misery. The wise man listened carefully and said: “Take one of your camels and let it live inside your house”. The man did so and came back the next day. “Oh poor me, he lamented, the camel smells, it takes half of the house, my mother-in-law complains, my children weep all the time, my wife is desperate. 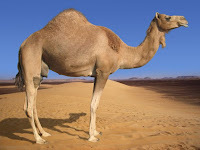 What shall I do?” The wise man said: “Take another camel and let it live inside your house”. The man did as he was told and came back the next day, totally desolate. “The camels bite and spit, the children are filthy, and my wife threatens to leave me”. The wise man said: “Take yet another camel and let it live inside you house”. The man didn’t dare to protest and did as he was told, but when he came back again he was on the verge of insanity. The wise man said: “Take out the camels and let them live outside”. The man came back the next day and said: “Oh the Wise One, thank you! We have plenty of room now, everyone is pleased, and even my mother-in-law loves me dearly”. Today we have taken away our second camel. I recon the first one disappeared when we put the furniture more or less where it is supposed to be. Today we stored all excessive items with a storage firm. It only took three trips across the town, but now we have enough space and don’t have to climb over stools and shelves. Tomorrow we’ll get rid of the third and last camel: we’ll take my books to the office. Goats is another version of the same story. I think camels are more spectacular.